Over a thousand U.S. workers who participate in employer-sponsored defined contribution plans were surveyed by AB Global and asked a handful of questions to gauge their overall level of financial literacy. Sadly, very few participants were able to answer more than half of the questions correctly, and the question that proved to be the most difficult had to do with the relationship between interest rates and bond prices. Specifically, participants were asked “If interest rates rise, what will typically happen to bond prices?” Only about one in three (34 percent) quiz-takers were able to correctly answer that bond prices should typically fall when interest rates rise. Since some people may struggle with a purely mathematical explanation of this inverse relationship, a simple thought experiment will perhaps be easier to understand. Imagine that you purchased a bond for $1,000 (par value) with a 5 percent coupon rate (the yield the bond paid on its issue date). Now assume that some time has passed and general interest rates have risen enough so that the same type of bond (newly issued) now offers a 6 percent coupon. If investors can go into the market and pay $1,000 for a bond with a 6 percent coupon, why would they give you $1,000 for a bond that only pays 5 percent? To be attractive in the current market, the price of your bond would therefore have to decrease enough to match the same return yielded by prevailing interest rates. On the other hand, if interest rates had instead declined and the coupon for this type of bond fell to 4 percent, the bond you purchased should now be worth more than par since it provides a yield that is better than what can currently be obtained in the market for $1,000. Although oversimplified, this inverse relationship is an important concept for retail investors to understand since bonds are sometimes used as a “safe haven” during periods of heightened stock market volatility, and fixed income products often play a greater role in portfolio construction as people grow older. Moreover, the Federal Reserve raised the target range for the federal funds rate by 25 basis points to 0.50-0.75 percent in December. That was the first interest rate increase in a year and only the second hike since 2006. 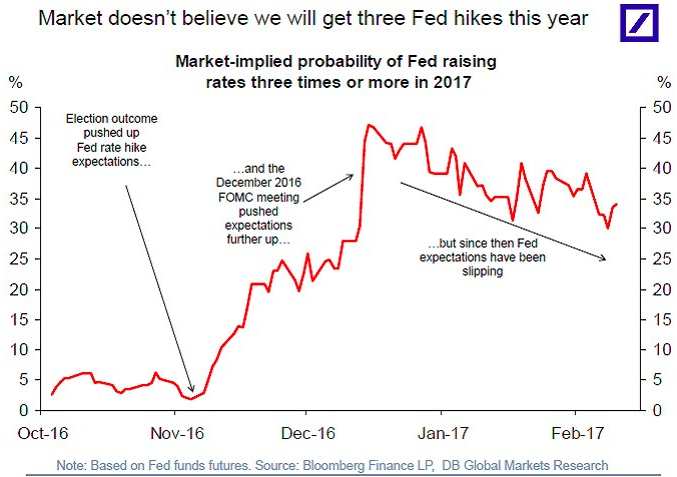 Updated projections released at that same policy meeting implied that officials expect there to be another three quarter point hikes in 2017. While the market has been skeptical of the Fed’s hawkish forecast, yesterday’s commentary from Fed Chair Janet Yellen should provide more evidence that the period of highly accommodative monetary policy is ending. As we transition into this rising rates environment, it will be important to work with a professional financial advisor to determine exactly what role bonds should play in your investment strategy.